Phoenix, AZ—11/28/16—FastMed Urgent Care, the nation’s fastest-growing urgent care provider, will be supporting the U.S. Marine Corps Reserve Toys for Tots Program during the 2016 holiday season. The company is asking local donors to drop off new, unwrapped toys at the more than 100 FastMed clinics located throughout Arizona, North Carolina, and Texas. All toys collected will be turned over to Toys for Tots and distributed to less-fortunate kids in the communities where the toys are collected. Each year, the U.S. Marine Corps Reserve Toys for Tots Program collects new, unwrapped toys during October, November, and December and distributes them as Christmas gifts to less-fortunate children in the community. The goal is to deliver a message of hope to these youngsters to assist them in becoming responsible, productive, and patriotic citizens. Toys for Tots considers children one of our nation’s most valuable resources. The campaign helps unite all members of the local communities in a common cause. Most of the collection and distribution takes place in communities where a U.S. Marine Corps Reserve Unit is also present. “We’re excited to participate in such a worthwhile cause and hope all the families in the communities we serve will join us in bringing joy to kids at Christmastime,” adds Bohannon. 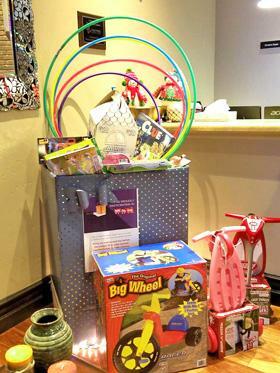 Toys can be dropped off during regular clinic hours at all FastMed locations through December 15. Most clinics are open seven days a week, including holidays. Exact hours and locations can be found at www.FastMed.com.